32 FLEX007 MAGAZINE I JULY 2018 It's a good thing to have both of those gener- ations working together. You see the new guys come in and bring their new skills to the table and the legacy guys keep you grounded, mov- ing in the right direction and offer incredible advice to those who listen. Shaughnessy: Is there anything we haven't covered that you want to mention? Schulte: It's cool to have this opportunity to talk to you. I enjoy this field of work and designing circuit boards has become a passion of mine. It's something I didn't know I would ever be doing and I feel pretty fortunate to have stumbled into it. It's a great career and I wish there was a more formal path for people to see this skillset and learn this skillset than on the job, because you look around and you don't really see any design certifications out there. 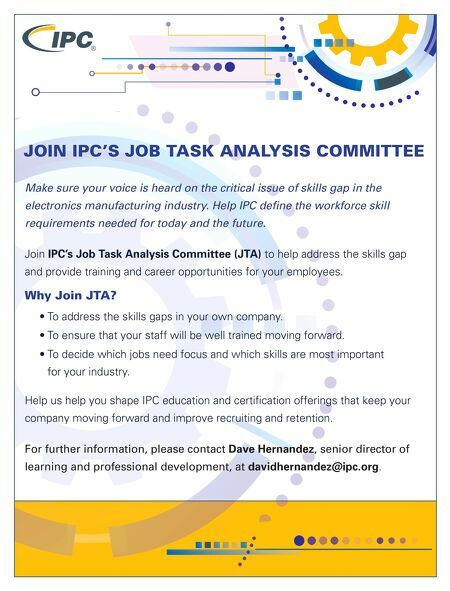 Besides the IPC CID and CID+ certs, there isn't much training out there. I haven't seen any tech schools offering PCB design courses or certificates or anything. You really just have to get your hands on it and do it a lot. 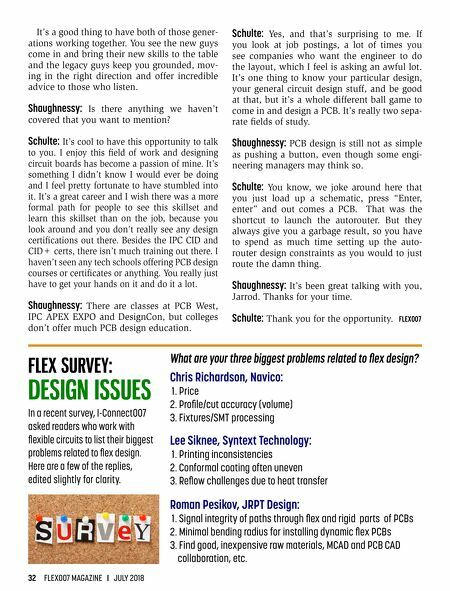 Shaughnessy: There are classes at PCB West, IPC APEX EXPO and DesignCon, but colleges don't offer much PCB design education. Schulte: Yes, and that's surprising to me. If you look at job postings, a lot of times you see companies who want the engineer to do the layout, which I feel is asking an awful lot. It's one thing to know your particular design, your general circuit design stuff, and be good at that, but it's a whole different ball game to come in and design a PCB. It's really two sepa- rate fields of study. Shaughnessy: PCB design is still not as simple as pushing a button, even though some engi- neering managers may think so. Schulte: You know, we joke around here that you just load up a schematic, press "Enter, enter" and out comes a PCB. That was the shortcut to launch the autorouter. But they always give you a garbage result, so you have to spend as much time setting up the auto- router design constraints as you would to just route the damn thing. Shaughnessy: It's been great talking with you, Jarrod. Thanks for your time. Schulte: Thank you for the opportunity. FLEX007 In a recent survey, I-Connect007 asked readers who work with flexible circuits to list their biggest problems related to flex design. Here are a few of the replies, edited slightly for clarity. FLEX SURVEY: DESIGN ISSUES Chris Richardson, Navico: 1 . Price 2. Profile/cut accuracy (volume) 3. Fixtures/SMT processing Lee Siknee, Syntext Technology: 1 . Printing inconsistencies 2. Conformal coating often uneven 3. Reflow challenges due to heat transfer Roman Pesikov, JRPT Design: 1 . Signal integrity of paths through flex and rigid parts of PCBs 2. Minimal bending radius for installing dynamic flex PCBs 3. Find good, inexpensive raw materials, MCAD and PCB CAD collaboration, etc. What are your three biggest problems related to flex design?